Trying to cover a lot of ground on my site, I regret that I don’t get to spend too much time in any one place – picking up terms and techniques without becoming fluent in any one country’s cuisine. But lately my Cuban cookbook research has kept me at home, literally and figuratively, so I was due for a side trip. A few weeks ago, I interviewed Mexican food writer and television show host Pati Jinich, whose first book Pati’s Mexican Table, I also reviewed for The Latin Kitchen. Generous with her time and advice but above all convincing, she’s inspired me to stock up on chipotle chiles like it’s the end of the world and presents recipes that easily fold into each other. Facing a busy week and many too-late-to-cook nights, I decided to make her tinga de pollo recipe posted here. It’s been great to come home to and no less special for being and every day event. This tinga de pollo looks amazing, Sofia! I like to watch Pati’s show and enjoy her tamales. Congrats on your NY Times Latin Kitchen! La autentica cocina mexicana es variada, muy variada. 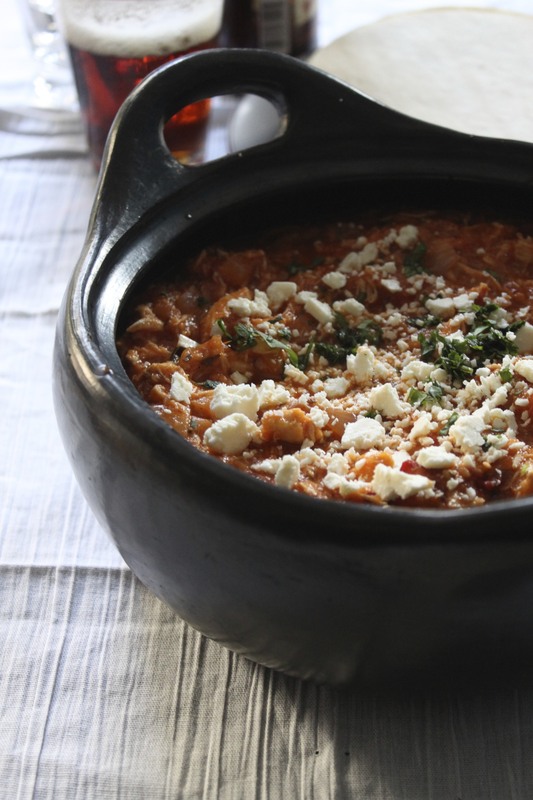 Ver una receta de tinga de pollo es una cosa asombrosa! Te agradezco y, desde México, se agradece a la chef que sepan difundir las autenticas recetas latinoamericanas. Me encanta tinga de pollo! Your pictures are gorgeous. I make mine in a slightly different way, using different spices. I usually add achiote as well. I love it so much that I made myself sick of it and when I had it in Mexico I almost couldn’t eat it because I had overdone it (like eating too many candy corns on Halloween. This makes me want to pull out the tinga again. Thank you! Thank you, hadn’t discovered the latin kitchen – very good. This looks amazing, I wonder if I can try it on my slow cooker.